Delta is Ready When You Are? I too have been abused by Delta airlines. You can read my observations below this article about Carrie Salberg’s recent humiliation at the hands of Delta airlines employees. MINNEAPOLIS, MINNESOTA– [Excerpt provided by Inclusion Daily Express] While her nurses were stowing the 100 pounds of medical equipment she needs to travel with, Carrie Salberg was given a startling order: Get off the plane. Salberg, who has muscular dystrophy, was never told why she couldn’t use the ventilator she requires to breathe on the Jan. 13 flight that was supposed to carry her back home to the Twin Cities from New Orleans. In fact, just a month before the flight, Delta Air Lines said her equipment met the company’s requirements. Salberg’s story illustrates the confusing landscape of federal regulations and airline policies that confront people with disabilities when they travel. The Air Carrier Access Act, established in 1986, prohibits discrimination against someone with disabilities during air travel, provided any necessary medical equipment is approved according to in-flight rules. But disabled travelers are increasingly complaining about their rights being violated. “You got any paper work?” she said. “What paper work?” I asked. At this point a second flight attendant came from the rear of the plane and showed me my seat. But flight attendant number one wasn’t quite done. She began complaining loudly to the gate agent. Where was the paper work? That dog can’t come on the plane without paper work. An embarrassing argument was occurring just a few feet away from me while passengers fumbled and pushed their fat luggage into the overhead bins. At this point I piped up and said loudly that as a passenger with a guide dog I felt completely unwelcome on this flight. You could have heard a pin drop. Then flight attendant number one shouted to the gate agent: “Did you hear what he said?” I suspected that I was going to be thrown off the flight. It was touch and go. Then there was some mumbling between the agent and the attendant. And then the crisis passed. The door was closed. The flight was going to go with me aboard. This was a Delta flight in name only insofar as the operating airline was a subcontractor. The more subcontracting there is in the commercial airline industry the more cost cutting there is in terms of staff training. Every airline passenger knows that this in turn leads to diminished service in all kinds of areas. 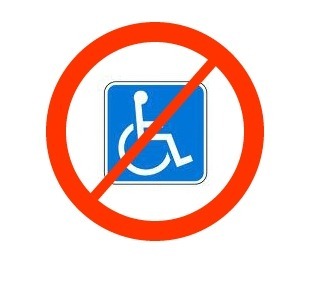 But the situation is especially revealing for passengers who have disabilities. Insufficient training of airline employees can lead to humiliation of passengers with disabilities and yes, to outright violations of their rights. Would it help if Delta airlines apologized to me? Maybe. But the proper thing for the industry to do is to hire seasoned travelers who have disabilities to train their employees in disability etiquette and the rules of the road.